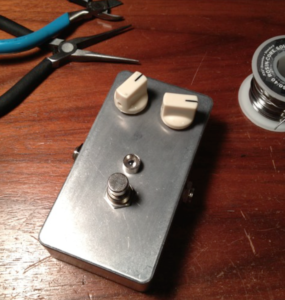 This is a guide to building a Fuzz Face. It’s a step by step set of instructions. 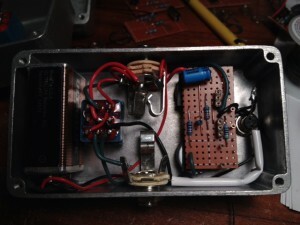 The build uses perfboard and mounts the pots on the board which makes a for a clean build with little board wiring. 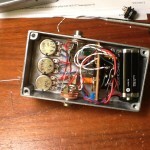 This is a great sounding project the parts are pretty easy to get. 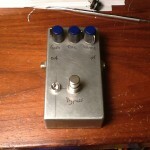 Finally getting back to building some Fuzz Face’s I started a while back. 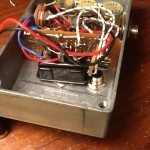 Here’s a picture, you can see the sockets for the transistors, two sets of three in a row, in the center. The input socket is two small socket pins on the right center, and the output cap is on the bottom center. Here’s a Fuzz Face with custom 60s eyeball design in sharpie. 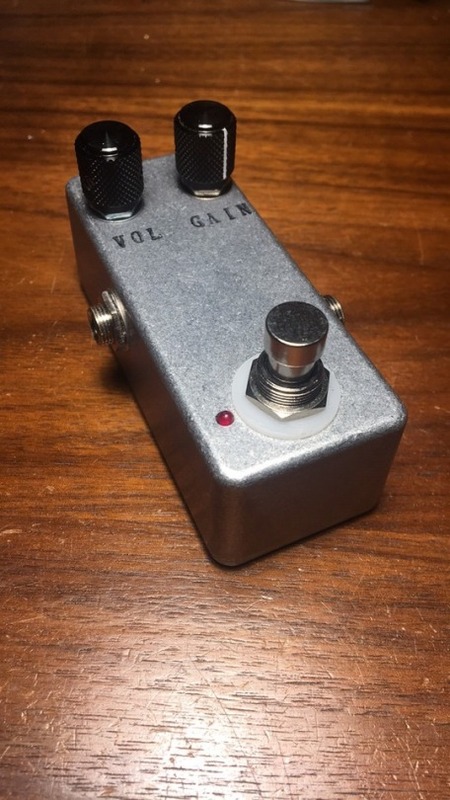 This is a Si/Ge hybrid Fuzz face with a blend cap on the input. 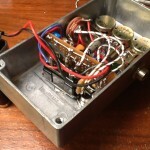 Here’s Fuzz Face wired up and stuffed in a “B” sized box. This box is from 4Site electronics. Great finish and excellent screws much better than the Taiwanese boxes that are commonly available. 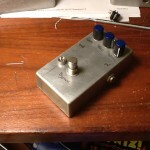 A few pictures of a Fuzz Face I made for a Joe. Turns out Joe hadn’t heard of the Fuzz Face. So I thought I make one for him. 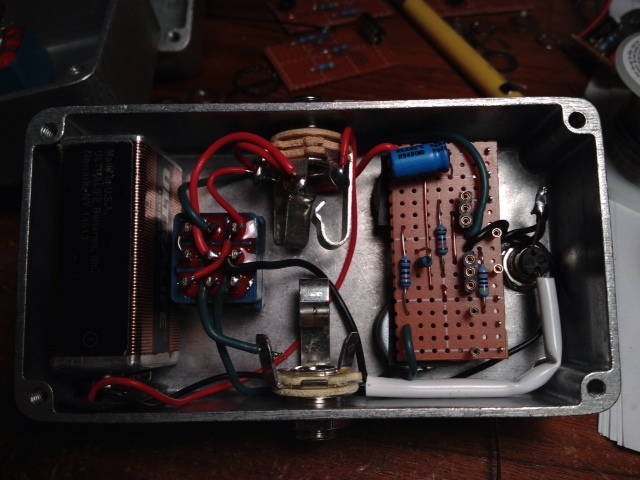 This one uses a Silicon 2n3906 for Q1 and a Germanium transistor for Q2. 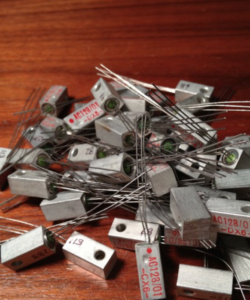 The Germanium transistor is a Chinese model not sure what the number is, that I got from Small Bear Electronics. 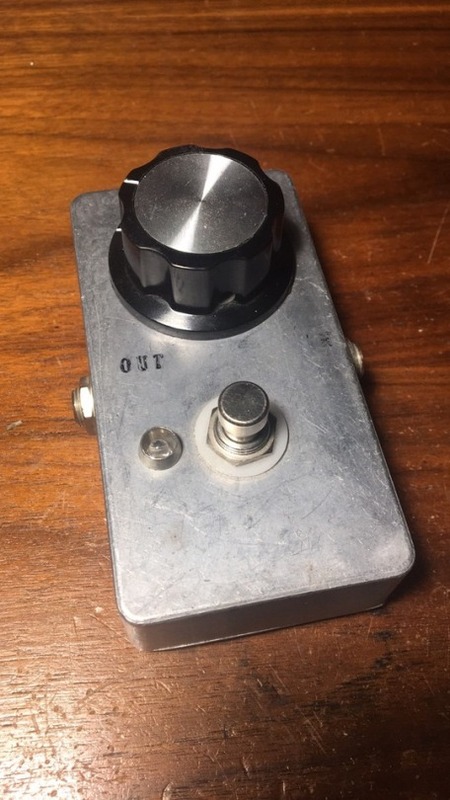 This has the typical Fuzz and Volume controls. 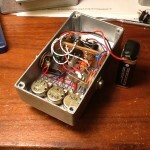 The third pot is a variable input cap. That pans between an .01µ and 3.3µ cap. The tone change is not extreme but is noticeable and seems like it would be good for adjusting between different instruments. I used some right angle PCB mount pots. These seem like a good idea.They provide a great way to mount the board and cut down on wiring. After building a few projects with these I have come to the conclusion that these would be great with fabricated PCB with through plated holes. For projects created with perf board or strip board you end up having to solder under the pot, it’s almost like building a ship in a bottle. Projects created with perf board or strip board are more prone to errors. Fixing these would either require removing the pots or bending them out the way to reach soldered connection underneath. With a through hole PCB you could solder the pots from the top of the board, and the board would be far less likely to need debugging.